Northern Ireland are still without a point in their 2015 European Championship qualifying campaign after losing 3-0 to Italy in Giglio. The match was in the balance until the closing stages, with Italy leading 1-0 before they struck with two goals in the final four minutes to take victory. 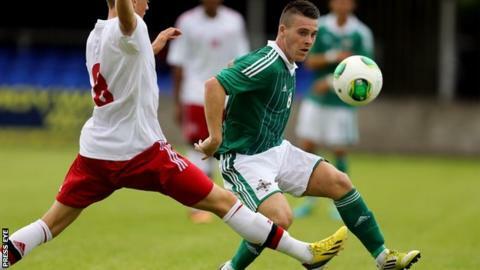 For Northern Ireland, it was the fifth successive defeat of the series. Only an outstanding goalkeeping display by Conor Brennan prevented the home side enjoying a greater winning margin. Brennan made a string of fine saves in the face of an Italian onslaught in the second half. After a closely contested opening period Kirk Millar had a chance to open the scoring for Northern Ireland midway through the first half but goalkeeper Francesco Bardi made the save. Federico Viviani gave Italy the lead in the 26th minute when he beat Brennan with a fine free-kick after being fouled by Josh Carson. After the interval, Brennan denied Matteo Politano, Francesco Fedato, Luca Antei and Viviani from adding to the lead. Luke McCullough and Ryan Brobbel had scoring opportunities for Northern Ireland, but neither effort troubled Bardi. Substitute Antonio Rozzi struck in the 86th minute and Andrea Belotti added the third two minutes from time.